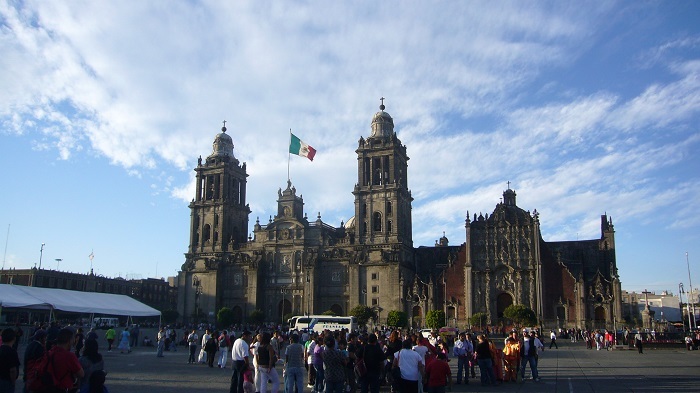 The Mexico City Metropolitan Cathedral, also known as the Metropolitan Cathedral of the Assumption of the Most Blessed Virgin Mary into Heaven, is the largest cathedral that has been built in the Americas located in the capital city of the United Mexican States, Mexico City. 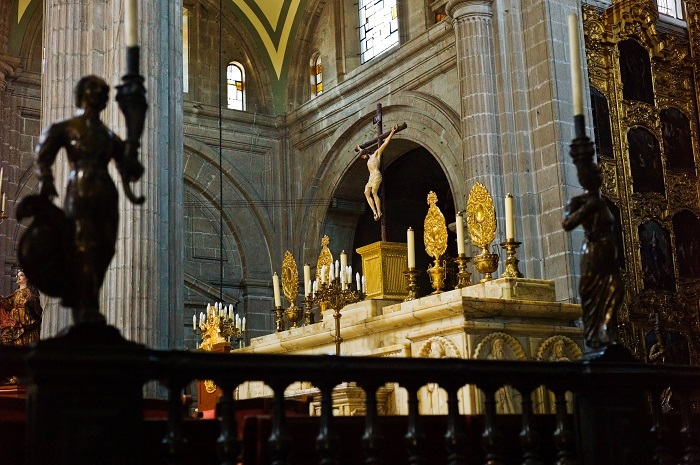 Serving as the seat of the Roman Catholic Archdiocese of Mexico, it is situated atop the former Aztec sacred precinct near the Templo Mayor on the northern side of the Plaza de la Constitución in Downtown Mexico City. 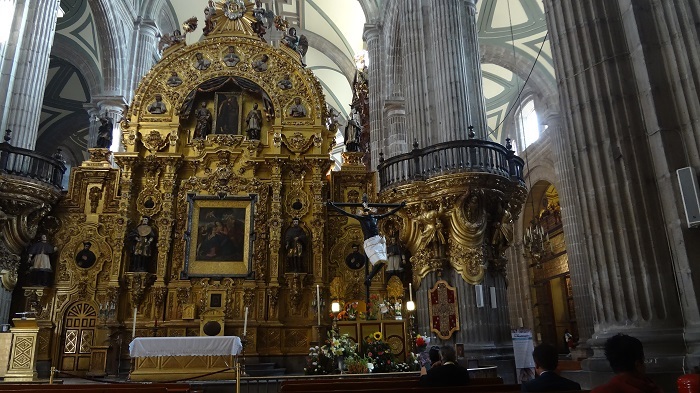 There was another church which was built soon after the conquest of the Spanish conquistadors, and the cathedral that we see today was built in sections between 1573 and 1813. 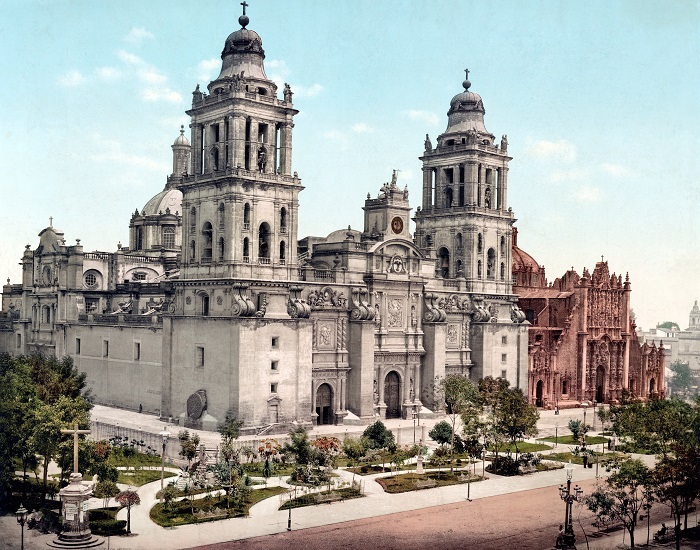 It was the Spanish missionaries that converted the Aztec who then tore down their temples and used much of the stone to construct the cathedral. 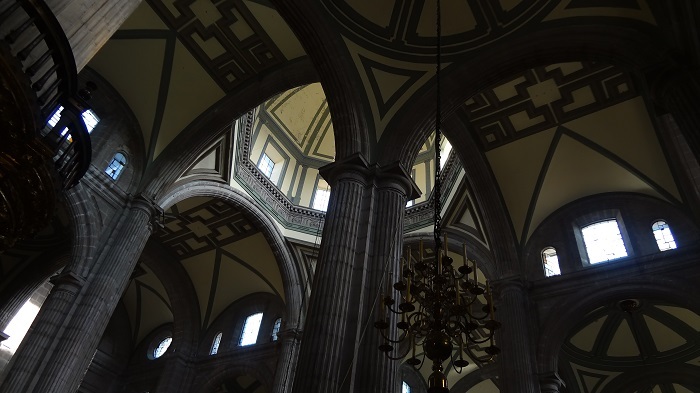 The original church was then replaced entirely, and the Spanish architect Claudio de Arciniega was the person in charge of the construction plans, where he drew inspiration from some Gothic cathedrals around Spain. 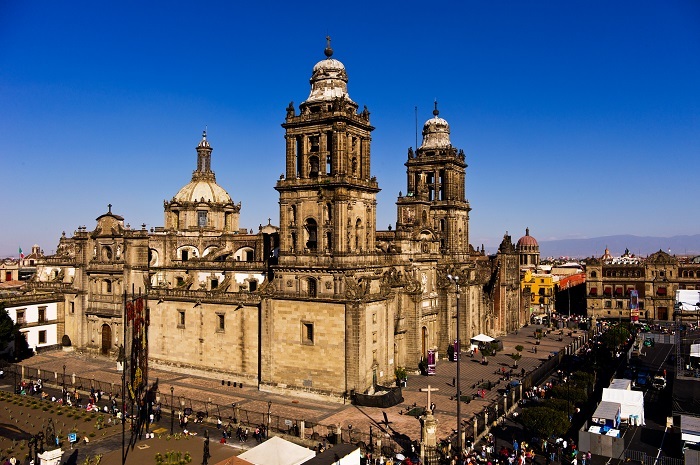 The massive proportions of this amazing cathedral are 110 meters (360 feet) in length and 55 meters (179 feet) wide, with one big dome. 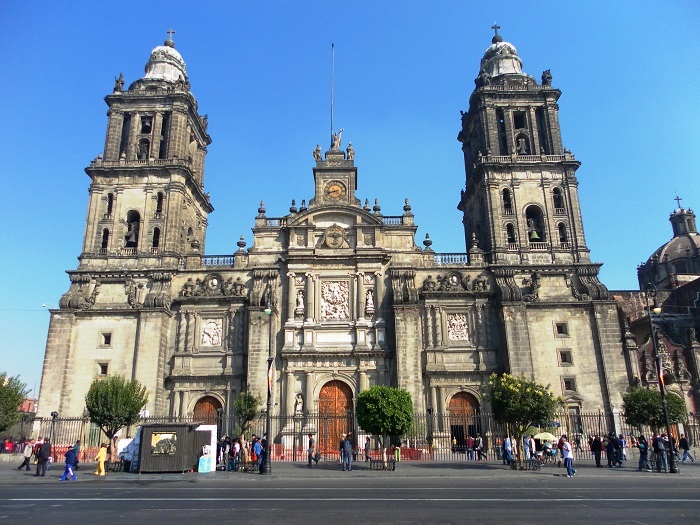 As the construction took over two centuries, the main architectural style that is followed is the Baroque, however, there is a mixture of Renaissance and Neo-classic architectural styles as well. 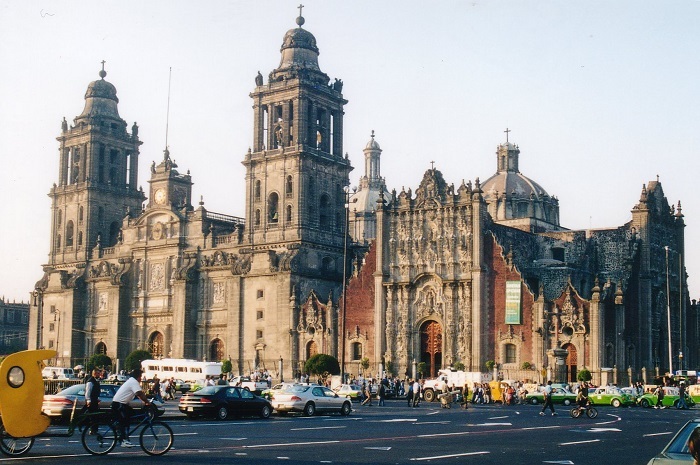 The façade of the cathedral is a magnificent medley of the before mentioned architectural styles, where the main façade is looking to the south. 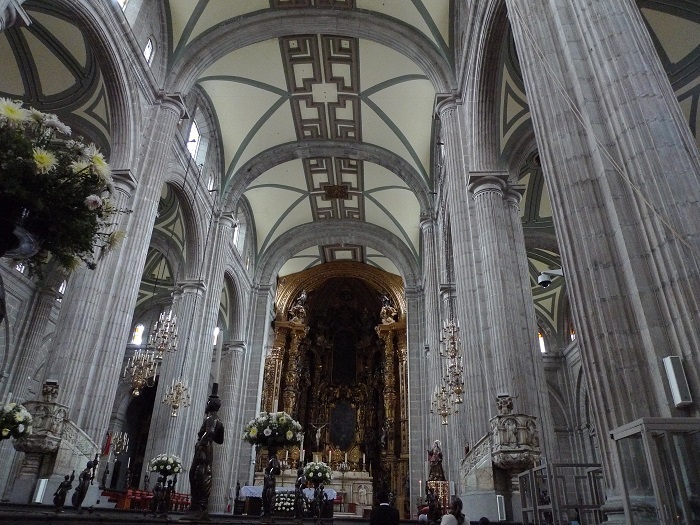 The main portal is centered in the main façade and is the highest of the three portals the cathedral has. Statues of Saint Peter and Paul the Apostle stand between the columns of the portal, while Saint Andrew and James the Just are depicted on the secondary doorway. In the center of this doorway is a high relief of the Assumption of the Virgin Mary, to whom the cathedral is dedicated. 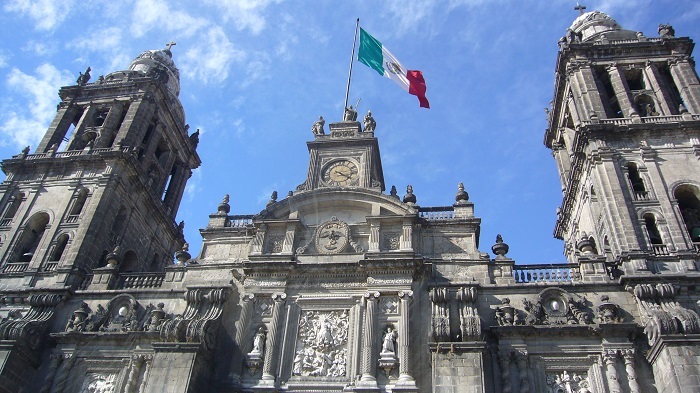 The really interesting part is the Coat of Arms of Mexico that stands above the doorway, with the eagle’s wings outstretched. 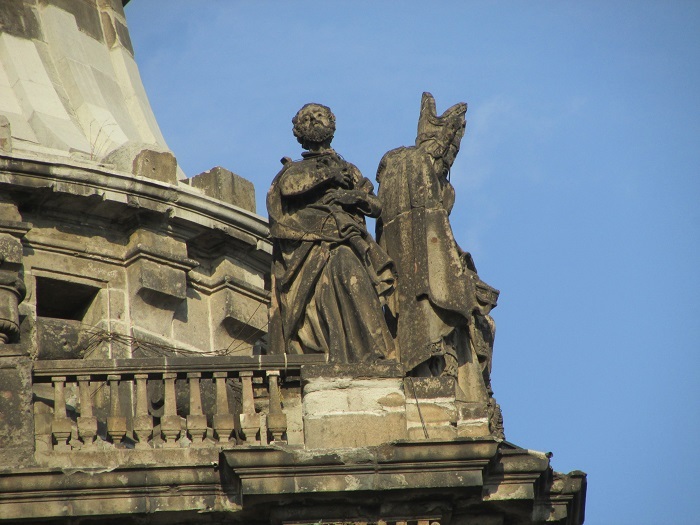 There is also a clock tower at the very top of the portal with statues representing Faith, Hope and Charity, which was created by sculptor Manuel Tolsá. 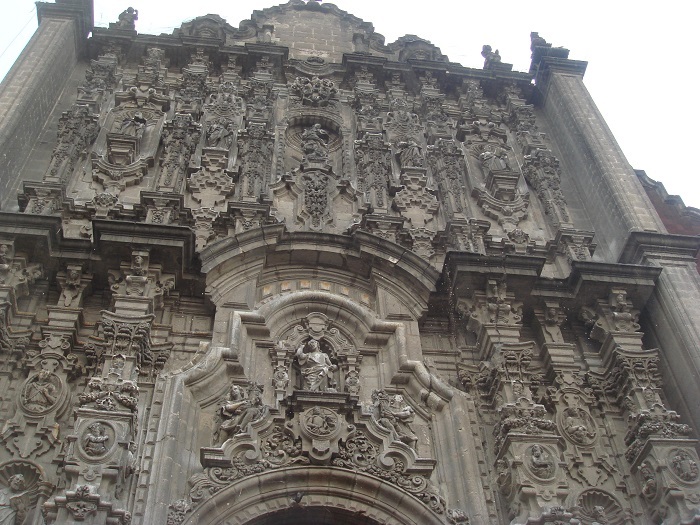 The west façade was constructed in 1688 and rebuilt in 1804, which has a three-section portal with images of the Four Evangelists, and also it contains high reliefs depicting Jesus handing the Keys of Heaven to Saint Peter. Similar to this façade is the west one, which has reliefs on the east portal show a ship carrying the four apostles, with Saint Peter at the helm which is titled The ship of the Church sailing the seas of Eternity. The northern façade was constructed in 16 century and it is the oldest part of the cathedral which was named after the architect of the El Escorial monastery in Spain, Juan de Herrera. 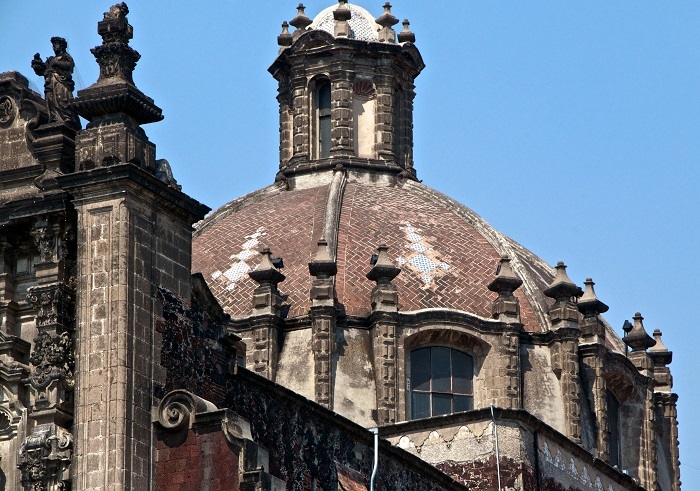 That is why this type of architectural style is named Renaissance Herrera style. 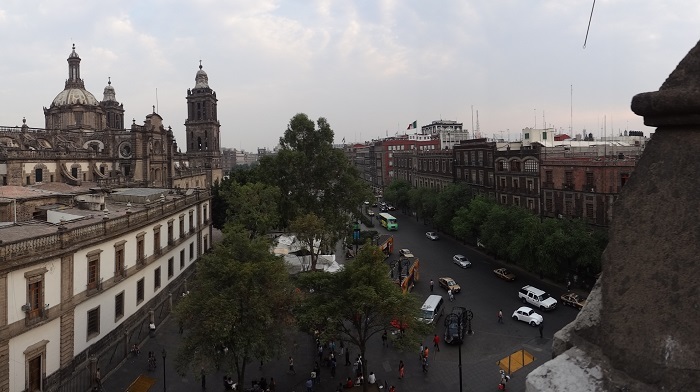 There are bell towers that were constructed by the Xalapan artist José Damián Ortiz de Castro, which are capped with bell-shaped roofs made of tezontle covered in chiluca, which in fact is a white stone. 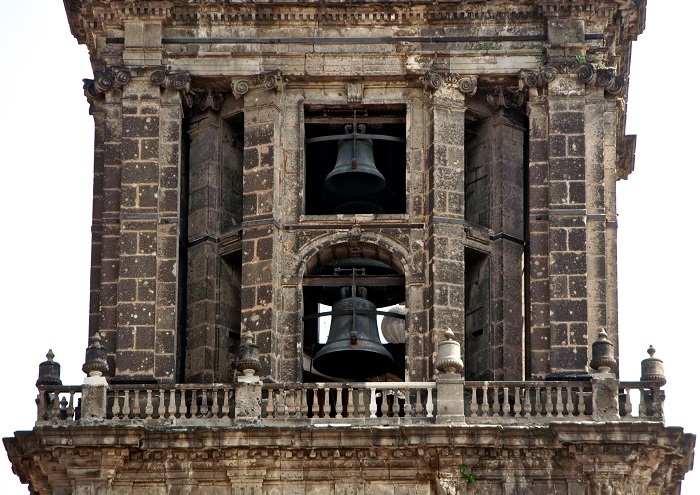 With 25 bells, there are 18 which hang in the east bell tower and seven in the west tower, and the largest bell which is name as Santa Maria de Guadalupe weighs 13,000 kg (29,000 lb). 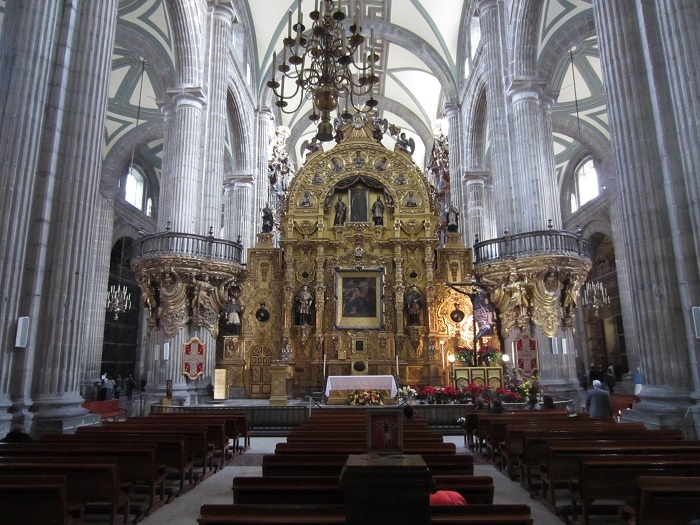 The interior houses the impressive Altar of Forgiveness and Altar of the Kings, together with the Chapel of Our Lady of the Agonies of Granada, Chapel of Saint Isidore, Chapel of the Immaculate Conception, Chapel of Our Lady of Guadalupe, Chapel of Our Lady of Antigua, Chapel of Saint Peter and plenty of other chapels. 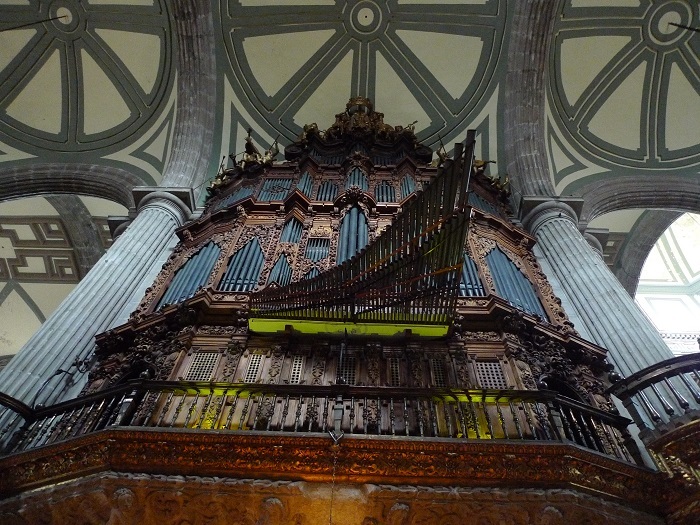 Due to the location of the cathedral which is built on a sinking ground and in an area which has seismic activity, the Metropolitan Cathedral is actually sinking to the ground, however, a measures are being taken in order for this alluring work to be preserved. 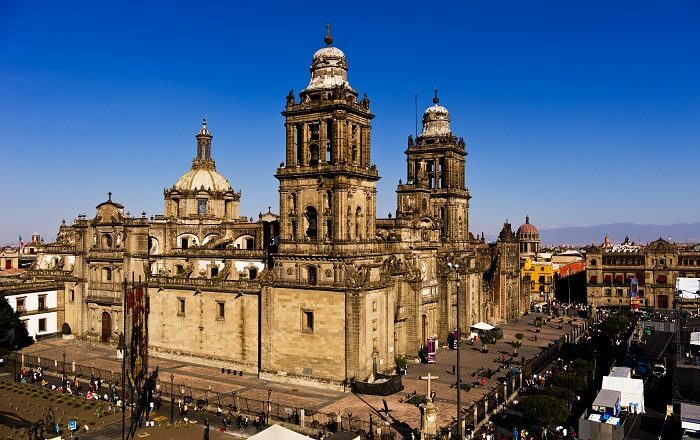 At the beginning when it was built, it took 42 years for the foundation to be laid, and even then due to political reasons, the Spanish did not built the entire cathedral on a solid foundation. 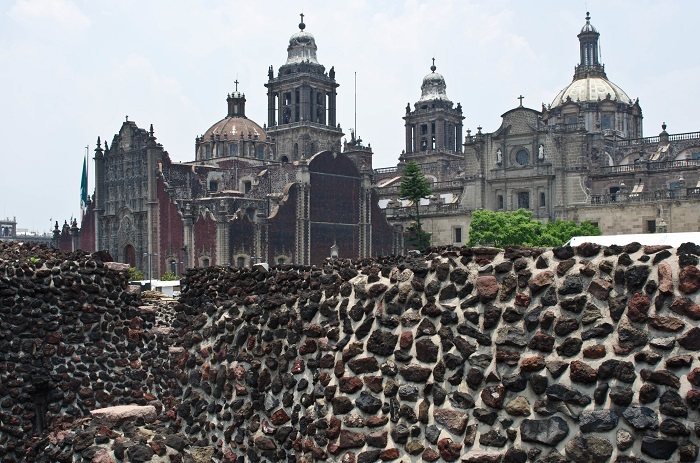 That is why the cathedral has been sinking ever since into the lakebed, and even there was some work done in 1970s in order to stop this, the sinking continued. 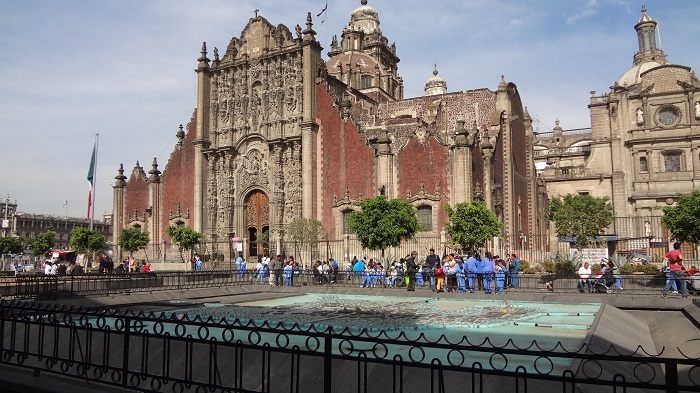 Finally, in 1998 the cathedral was included in the 1998 World Monuments Watch by the World Monuments Fund, where a major restoration and foundation work began in 1990s to stabilize the building. Engineers excavated under the cathedral between 1993 and 1998, where they dug shafts under the cathedral and placed shafts of concrete into the soft ground to give the edifice a more solid base to rest on. These efforts have not stopped the sinking of the complex, but they have corrected the tilting towers and ensured that the cathedral will sink uniformly. 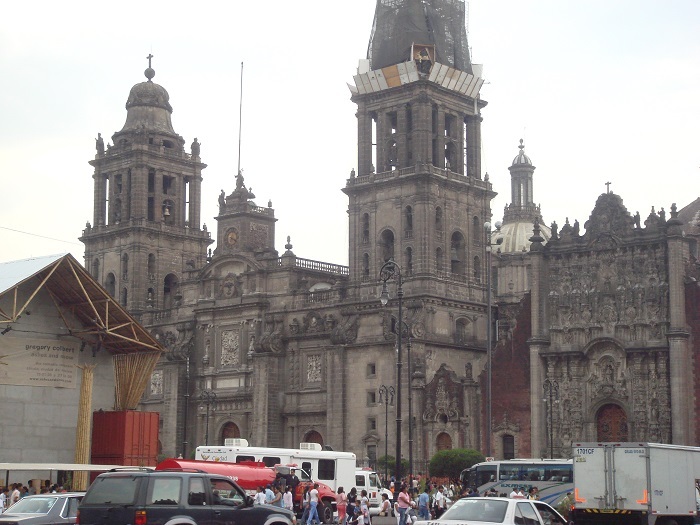 Nowadays, this glorious historic monument speaks about the long history of the Mexican capital, and as the city has grown exponentially throughout the years, the importance of the Mexico City Metropolitan Cathedral has remained intact and there are plenty of locals who are visiting it in order to pray, along with the tourists who would like to see a large piece of history from the times when the Spanish Empire was the most powerful.